As I have stated before, I like reading Joanne Fluke’s Hannah Swensen mystery series. The books are fun and easy to read. The added bonus is the author provides recipes. I have found the recipes for watermelon cookies and pretzel chocolate chip cookies in her book. This is another one of her recipes found in the Lemon Meringue Murder. 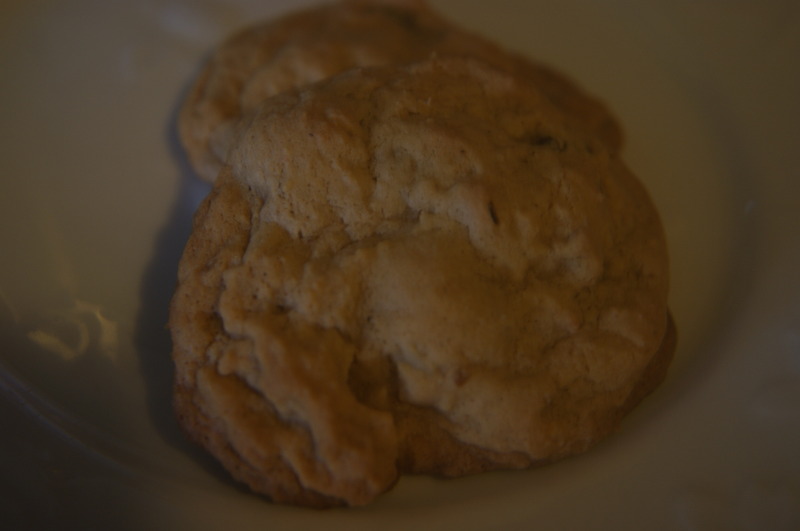 I made these cookies once and I remembered people raved about their taste. They couldn’t believe the secret ingredient in these cookies. I do not know where I put my copy of the Lemon Meringue Murder so I lost the recipe. This week I decided to google the recipe and got lucky. Add sugar and then let it cool. Add tomato soup and beat together. Stir in cinnamon, nutmeg, baking soda, and salt. Add the raisins and walnuts. Add flour 1 cup at a time until it is incorporated. Drop by teaspoons on a greased cookie sheet. Makes around 10 dozen cookies. I found this recipe right after hubby and I got married. It was in our regular main dish rotation for a few years. The ranch chicken legs were also a go to recipe for when I entertained family members. During the past few years, I have made it infrequently. So when I found chicken legs on sale, I decided to put it on our menu. I love how simple this recipe is and how tasty the chicken is. In a ziplock bag, place bisquick and ranch dressing. Mix well. Set aside. Place butter in a 9 by 13 baking dish. After the oven is done preheating, place the pan in the oven until the butter is melted. Once the butter is melted, pull the baking dish out of the oven. Dredge each piece of chicken in the bisquick-ranch mixture. Make sure each piece is coated. Place each chicken leg in the baking dish skin side down. Bake at 400 degrees for 20 minutes. Pull the baking dish out of the oven. Flip the chicken and then bake for an additional 15 minutes. I had a coupon for the new Philadelphia cooking creme and they were also on sale this week so I decided to try them. Since I had never made a pot pie, I decided to try it using the cooking creme. It ended up being delicious. My hubby gobbled it up which is saying alot. The Wee One and the Imaginative One did not like it. They ate some of it but it was not their favorite. Mix the veggies, chicken, and cooking creme together in a bowl. Place mixture in a 9 inch pie pan. Place the pie crust over it. Score the pie crust. Place in a 400 degree oven for 30 minutes. I’m not endorsed by Philadelphia Cooking Creme. I just enjoyed this product. Updated on June 21, 2016 – The Philadelphia Cooking Creme has been discontinued so I looked up how to make the cooking creme. I’ve update the recipe with the ingredients needed to make the savory garlic cooking creme. Last week, I found deals on red potatoes, roast, chicken legs, and steak. Since the red potatoes were on sale for a dollar for 3 pounds, I decided to change up when I’m going to make the Italian chili and beef stew. Wednesday is suppose to be rainy (again) so I’m going to make the stew then. This week’s deals are on ground chuck and chicken breasts.